Ladakh's Himalayan ecosystem has led to the development of a distinctive agricultural economy and lifestyle. Many of the local people of Ladakh practice farming and the produce of their fields is made into the delicious dishes of Ladakhi cuisine. Vegetables such as potatoes, pumpkins, beetroots, and beans are cooked in a variety of different ways and accompany meat dishes. Mutton and chicken are the commonly consumed types of meat in Ladakh. The staple food of Ladakhi people are Sku and Thukpa (made of wheat flour), Pava (made of sattu) and khambir (local bread). 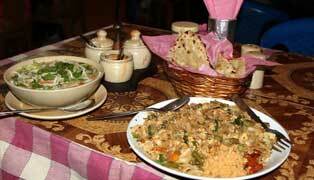 Tourists in Ladakh can try local Ladakhi food, which is nourishing and usually mildly flavored. Favorites include Thukpa, a thick soup with vegetables that provides a complete meal and delicious Momos or steamed dumplings stuffed with meat or vegetables, accompanied by a fiery chili sauce. There are also many bakeries in Ladakh where you can buy freshly baked bread and enjoy eating it with locally made Apricot Jam. There are many restaurants in Leh, where you can have an international meal or choose from Tibetan or Ladakhi fare if you prefer. A two-day traditional food festival is organized by an NGO. Women Alliance in Leh, where they serve all local dishes made hygienically and it is done mainly with an aim to popularize its rich traditional culture and boost tourism. Ladakhi people are celebrating this food festival for last 15 years. Every year the festival attracts a large number of tourists from across the world with its local delicious ladakhi food.